The graphic is self-explanatory. What do you think about what it is saying? I think it’s an extreme over-simplification. Of course the “complementarian” thinks his view reflects the Biblical truth. I disagree. 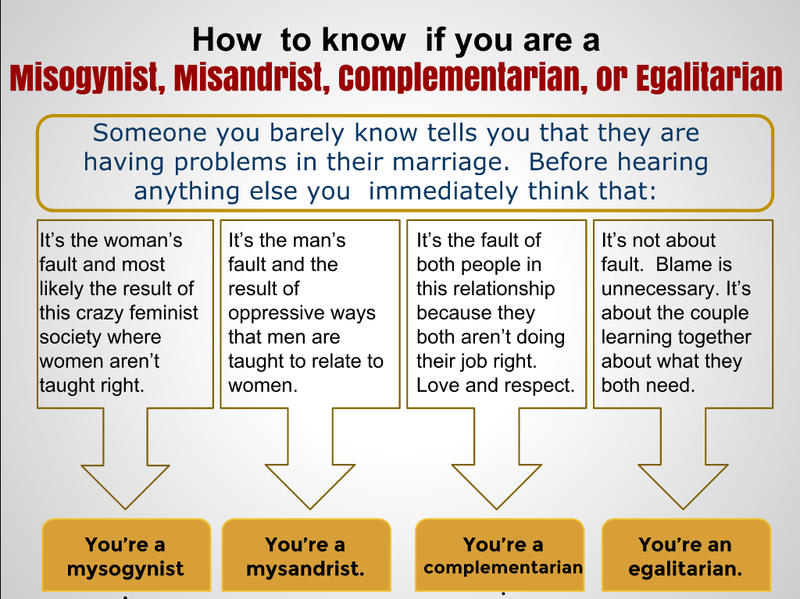 As a Bible-believing egalitarian, I can’t relate at all to #4. It may very well be someone’s fault. It may be the man heard the complementarian “Love and Respect” teaching and now thinks he has 51% of the authority in thh marriage and thus, veto power, and now he is trying to impose his decision on the wife and she’s not buying it. The truth here is that #3 and #4 are both as unreasonable as #1 and #2. You’ve jumped to a conclusion before you even heard the couple’s story. And that’s ridiculous. They are all over-simplifications, but, all may contain a kernel of truth. Sometimes it’s the one person’s fault. Sometimes both are at fault. Sometimes, both mean well, but don’t know how to express that. I would not say any of those things – unless I have learned enough.